Muda : Recognition: necessary at all levels. I have recently helped an organization to get a certification, because of its performance and practices regarding Lean and Six Sigma. This certification is provided by the corporate office to certify the level each of its facilities held regarding Lean and Six Sigma. I helped this organization coaching and facilitating most of all. But it was the supervisors effort, motivation and the associates interest which made possible to achieve this recognition. They all made a great effort but one supervisor made an extraordinary effort to encourage his people to, not only practice, but to investigate further and teach others, giving the opportunity for them to give small presentations. Allowing the people to grow and learn. Recognition to those who deserve it. I made a public display about the situation described above. The supervisor was overwhelmed, and thanked me, for recognising his efforts. I am not his direct supervisor, but i believe that we should give credit to people, when something extraordinary happens or when something outstanding is encouraged. During the certification the plant manager conducted the gemba walk and when the certification was over, and the award was given, nobody was even close to it, as the manager took it and never let it go. I notice that all VPs and Directors started sending congratulations for the facility and the manager, but also notice that nobody forwarded those notes to the supervisors or the people who actually performed the job every day. I understood that as well as front line workers, some managers also need recognition. The problem I see, is when they get recognition, but do not share it with the rest of the team. To build joy in every workers job, we need to start practicing respect for people. Respect for people involves people at the top too. But we should´t forget front line workers. Respect people´s opinion, challenge them to think, to learn, to experiment, to grow, to improve. That´s respect for people. Listen to their opinions. Have an open mind to accept that managers aren´t always right, and realizing that workers know more about the job, than we can imagine. Dr. Deming was a great example of this quote. He worked until the last moment of his life. He died at age of 93 and he was still working. This clearly shows that he had a great joy in what he was doing. So, If we want to turn our companies in sources of innovation, if we want to make a contribution and take pride of our work, we better start recognizing people. Don´t know how? How about start with your children, wife or a friend. Lets start identifying those small things we all do everyday, that really make a difference. Soon, recognition will become a habit. Thank´s for reading. I would love to read your thoughts. Don´t be shy, and leave a comment down here. 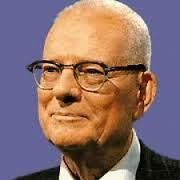 Etiquetas: Dr. Deming, leadership, pride, Recognition, respect for people. It would be great that all VP's & Directors understand and do it. Their companies would be more competitives because it increase the ownership of the employees. Totally Agree Rocio. It is amazing how recognition turns people´s minds and actions upside down. All people should learn and practice giving recognition. One practice I have started doing is recognizing small efforts with supervisors, and front line workers for small things they improve on a daily basis. I feel like it´s becoming an habit. Hopefully those workers would engage to improve through small recognition.